The Arts Festival is able to present the Mobile Art Galleries I+II (MAG) to students and community members every year through the support of Janus Henderson Investors, our partnership with the Scientific and Cultural Facilities District (SCFD), and on-site event programming like the Art Auction (http://www.cherryartsauction.org/). The Mobile Art Gallery consists of original works of art from exhibiting artists and tours perpetually throughout Colorado to schools, libraries, community centers and other public venues. The Mobile Art Gallery provides entrance to the visual arts in an accessible, non-threatening setting and introduces the public to various art forms through exhibition of original artwork. To make MAG a comprehensive educational experience, the Cherry Creek Arts Festival provides several educational tools that can be used in the classroom or as part of a community program. The Mobile Art Gallery Program Guide includes resource and reference materials that foster education of media and techniques the exhibiting artists employ. Developed for teachers, the Mobile Art Gallery Program Guide includes artist biographies, additional resources, inter-curricular lesson plans and activities. In addition, each work of art is accompanied by a ‘take away’ educational piece written in both English and Spanish. The Arts Festival is committed to involving the students and local community at each MAG residency. Students are actively engaged in the Mobile Art Gallery from its installation, to handling the art and to dismantling the exhibition. Student docents are trained to give tours of the Gallery to the student body and school community. Each school offers a Community Night whereby parents, school board members and the local community are invited to view the Gallery and take a docent-led tour. In an effort to expand outreach to the larger community, many schools open their doors to senior citizen centers, feeder schools and local arts groups to view the exhibit. 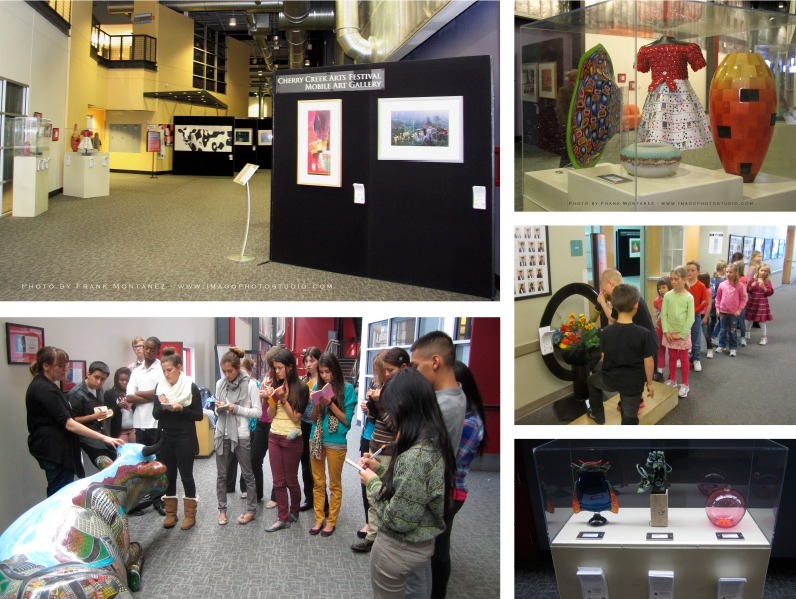 The Mobile Art Gallery Docent Program creates ownership and actively engages students in the Mobile Art Gallery, which is essential to a quality educational experience. Students at each school are trained as docents to give tours of the Gallery to the student body and school community. The docents are instructed on medium, technique and process of each two- and three-dimensional piece in the exhibits. Artist biographies and artist statements also give background to the work and aid interpretation. Since 1989, the metro area has grown into a fascinating place, indeed. Not coincidentally, that’s the same year the Scientific and Cultural Facilities District (SCFD) began providing funds for over 300 of the region’s most culturally diverse organizations. And clearly, we’ve all benefited from that. For more information about the Scientific and Cultural Facilities District (SCFD), visit our website at http://www.scfd.org.